Exklim has launched a kickstarter campaign for their ultra-portable take on external GPU's. Equipped with a GTX 1050 MXM card and running solely on power provided by the Thunderbolt 3 connection removes the need for additional power supplies and makes this a solution that can really be tucked into a laptop bag. The eX Core is still in the kickstarter stage and the marketing material leans towards promising more than the device might be capable of, but nevertheless it is an interesting product that is worth keeping an eye on. The increase in external GPU options has mirrored the growth of the Thunderbolt 3 port on which these modern embodiments are reliant. The concept of having an ultra-portable notebook that goes with you to class, or work, or traveling, but can then be hooked up to a separate graphics solution for at-home gaming is an appealing one. Earlier solutions (such as the Razer Core or Alienware Graphics Amplifier with proprietary connection) are largish enclosures that more closely match the size of an ITX gaming case, but 2017 and 2018 have seen more compact models appearing. This is where the eX Core from Canadian-based Exklim comes in. 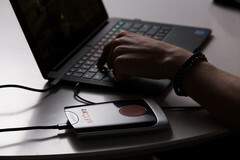 The eX Core contains a GTX 1050 (possibly mobile) on an MXM board which allowed them to get the size down to slightly larger than a 2.5-inch external hard drive. 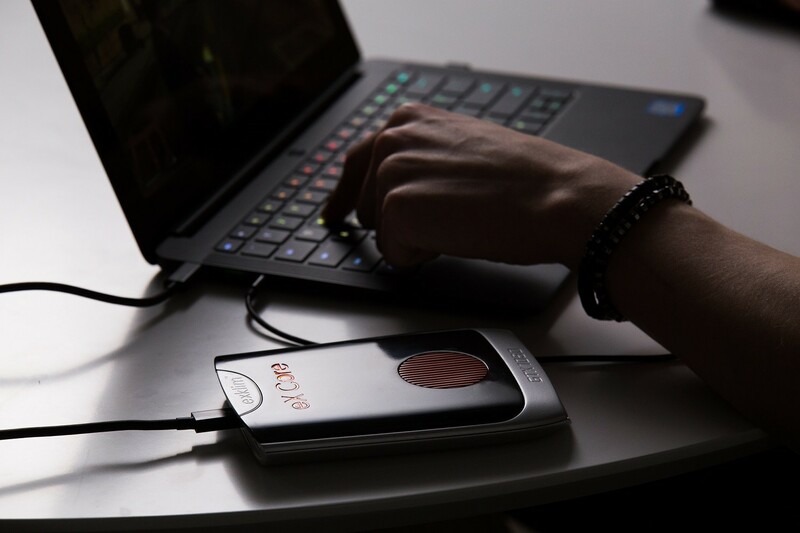 Exklim claims this to be the smallest eGPU around and combined with the ability for it to draw all the power it needs through the Thunderbolt 3 port, this makes it seriously portable. Cooling duties are performed by a single blower style fan which apparently keeps temperatures below 62 C, an impressive result considering the factory overclock to 1680 MHz. Keep in mind that this is on Kickstarter, so it isn’t a retail product yet, and all the usual risks and caveats of Kickstarter still apply here. Remember to use critical thinking when looking at the marketing material or watching their videos. The comparisons in rendering and gaming lack a lot of information on system specifications and settings used for the different setups#1, and bitcoin mining is a poor use case compared to the much higher hashing rate of other desktop cards or ASIC miners. The ‘GeForce GTX VR Ready’ logo is used a couple of times, but Nvidia doesn’t apply this branding to the GTX 1050. The Exklim eX Core is an interesting product, and while there are other compact eGPUs on the market (e.g., Sonnet eGFX Breakaway Puck or Palit (Galax/KFA2) SNPR External Graphics Enclosure) they aren’t as slim or as portable as the eX Core. Funding options start at CA$499 (US$397) with an expected delivery date of July 2018. #1 They have a video showing the eX Core playing GTA 5 on a Razer Blade Stealth 12.5-inch (i5-6200u, 8 GB RAM), so it is likely this system that was used for the eX Core benchmarks.